The following online-only published content is freely available electronically immediately upon publication and can be distributed under the Creative Commons Attribution-NonCommercial License (CC BY-NC). This license allows anyone to reuse, remix, and build upon the content, as long as it is for legal, noncommercial purposes; the new work must credit the author, the AJA, and the Archaeological Institute of America. The following print-published content is freely available electronically immediately upon publication and can be distributed under the Creative Commons Attribution-NonCommercial-NoDerivs License (CC BY-NC-ND). This license allows anyone to download the content and share it with others, as long as it is for legal, noncommercial purposes; the content cannot be changed in any way, and the AJA and the Archaeological Institute of America must be credited as the rightsholder. Additional print-published content is freely available electronically immediately upon publication and can also be distributed under the Creative Commons Attribution-NonCommercial-NoDerivs License (CC BY-NC-ND). The AJA also supports green open access, or self-archiving. Authors may post a copy of their e-print, or final paginated version published in the journal, in their funding agency’s or institution’s secure digital repository. Any reuse should include an acknowledgment to the AJA and the Archaeological Institute of America and a link to the version of record on JSTOR. Authors should not post the pre-print (original manuscript before peer review and editing) or the post-print (final accepted version; i.e., after peer-review but without AJA editing and typesetting). Only the abstract and a link to the version of record on JSTOR should be posted in an institutional repository not affiliated with the AJA author. Download all AJA content published before 1923. See a full list on the AJA Archive. 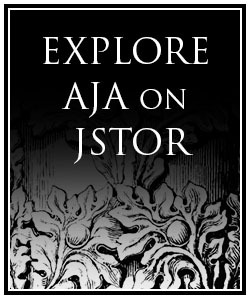 Read articles online through JSTOR’s Register and Read service. Register and Read does not include access to AJA Current Content, which runs from 2003 to the present.